The British government have recently unveiled plans to reduce the speed limit on rural roads from 60mph to 40mph. A disproportionate number of fatalities on British roads happen in the countryside, often due to speeding. Roads surrounding countryside villages usually use the national speed limit of 60mph and the reduction to 30mph inside the village is often instant. In 2010 292 motorcyclists were killed on rural roads, almost twice the number of fatalities that occurred on urban roads. These statistics are assumed to be so high because bikers like to ride in the countryside for recreational rides, but overall road fatalities also show that rural roads are significantly more dangerous. A motorcyclist is 50 times more likely to be killed or suffer serious injury than a car driver and 92% per cent of surveyed people (from Think statistics) think that motorcyclists are the most vulnerable people on the road. However, despite awareness of the vulnerability of motorcyclists, it is often motorists that are complacent or at fault in accidents on rural roads. 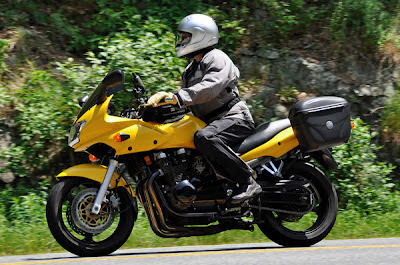 There are four types of common rural motorcycle accidents; the first three usually involve new riders but the majority of crashes with other vehicles are the fault of the other party. Bends and Corners - Misjudging corners and bends is an alarmingly frequent cause of serious accidents, although these mistakes are often made by new and inexperienced riders. Overtaking - Many countryside roads are difficult for two vehicles to pass each other in opposite directions. The open road with fresh air and a beautiful backdrop can entice a new rider into switching off and driving irresponsibly. One vehicle crash - This is usually by inexperienced, reckless or careless riders and is far more likely to happen on rural roads. The state and maintenance of countryside roads can be a contributing factor. Junctions - Crashes at junctions with other vehicles are common and dangerous. They are often the fault of the other vehicle, but it is the motorcyclist who is most vulnerable. No matter how many public campaigns are run or reflective clothing is worn by the motorcyclist, there is enormous risk and they have to be constantly aware for approaching vehicles and, once seeing them, assuming the driver’s an idiot. Experience, continuous improvement and self-awareness are keys to motorcycling safety, but that only reduces risk, it doesn’t eliminate it. Hopefully the new measures will be enforced and motorists on rural roads will drive with more responsibility, which will reduce the number of motorcyclist fatalities in the countryside. This post courtesy of Pannone LLP, a leading UK law firm who are specialists in personal injury cases.